Do-it-yourself crack repair A kit for contractors and homeowners. Allowable crack widths At what width does a crack become a problem? Emecole Crack Repair Kits are a top choice for pros and do-it-yourselfers. Using low-pressure crack injection, foundation and basement crack repair kits from Rhino Carbon Fiber seal basement cracks from the inside, eliminating the need to excavate the soil from around the outside of the foundation. The kits are available with all the tools and materials needed to treat cracks ranging from 10 to 60 feet in length and include step-by-step written instructions as well as a video tutorial. You can choose from crack repair kits that use either an injectable polyurethane foam or an epoxy, depending on the type of cracks you have (see Epoxies vs. Polyurethanes). Polyurethane crack injection kits are recommended for non-structural leaking cracks resulting from concrete shrinkage or minor settlement while epoxy injection kits are designed to treat more severe cracks that compromise the structural integrity of the wall. Determine the total length of the crack(s) needing repair and select the appropriate kit size (10, 30, or 60 feet). Determine whether you need to repair the crack with epoxy or polyurethane foam. 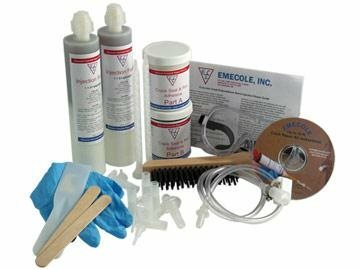 Use a polyurethane foam kit for repairing leaking non-structural cracks and an epoxy kit for repairing structural foundation cracks wider than a quarter of an inch or large areas of multiple cracks. Foundation Crack Repair Kit Repairs foundation cracks from the inside.